Canada’s oldest and most popular national park is world renowned for its shimmering turquoise lakes, dense evergreen forests, and towering peaks cloaked in massive glaciers. While the crowds may come for the park’s natural wonders, it’s the park’s foodie scene that takes many by surprise. We’ve uncovered some of the best dining spots in the park, with a focus on cost-effective options that offer travelers an experience they can’t get elsewhere. Here are our top three picks for best places to eat in Banff National Park. 1. Park Distillery Restaurant + Bar. 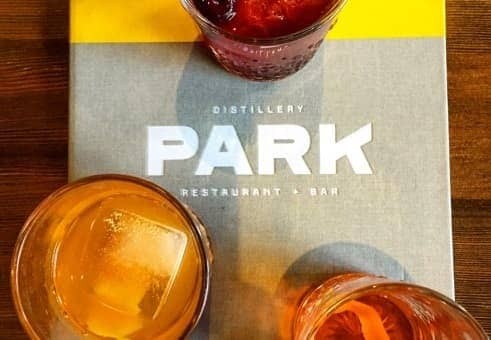 Despite being a relative newcomer, Park Distillery is one of the most popular dining spots in Banff, and with very good reason. The prominently placed Banff Avenue restaurant has earned accolades for serving up “campfire-inspired cooking” and craft cocktails that would draw long lines in any major city but seem especially at home in Banff. A friend and hiking buddy had raised our expectations ahead of time, so we were thrilled when our experience was even better than his commendations had prepared us for. Beyond the completely on-point service, we were astounded by the quality of the food. Viewfinder Tip: Park Distillery’s smoked s’more dessert tastes like a mason jar of childhood memories. If you can’t make room for it after dinner, plan to return just for dessert. To start, we had an expertly cooked plate of wood-fired asparagus with pickled eggs, parmesan, pine nuts, and lemon vinaigrette. The showstopper was the must-have “Mess Hall Standard”—a platter of BBQ ribs, wings, smoky rotisserie chicken, pork and beans, potato salad, coleslaw, and cornbread. Oh, and sweet, tangy, savory, smoky mop sauce on the side just waiting to be spread all over that wood-fired meat. 2. Storm Mountain Lodge. Situated halfway between the Banff townsite and Lake Louise, tucked in the trees just two miles off of the CA-1, stands the lovingly restored (but authentically rustic) Storm Mountain Lodge. The historic bungalow camp has earned a reputation for having the finest cuisine in the park. Just a handful of tables line the windowed log lodge, and a massive stone fireplace contributes to the romantic, days-gone-by ambiance. The cuisine compliments and contradicts the vintage vibe by balancing home-style and the comfortably familiar with novel and modern. Our dinner started with a locally sourced kale Caesar salad and an elegant, creamy squash soup dotted with bacon. The standout entrée was a trio of beautifully seared scallops adorned with a savory grilled peach, luscious cauliflower puree, and roasted heirloom vegetables. While we enjoyed several of the lodge’s signature old-fashioned cocktails, every meal can be paired with lovely Canadian wines sourced from the Okanogan Valley in British Columbia. 3. The Station Restaurant, Lake Louise. Just a few kilometers from iconic Lake Louise sits The Station Restaurant, a popular “reservations strongly suggested” dinner spot. But here’s a little secret: If you go for lunch, you don’t need reservations and you’ll have a very good chance of landing a quiet spot on the historic restaurant’s peaceful garden patio. After a morning of hiking around Lake Louise, we popped in for a quick lunch and much-deserved local brew. A crunchy-but-moist chicken sandwich topped with warm Brie cheese and a crisp Cobb salad—elevated with salmon, steak, and roasted duck—made for the perfect post-hike meal. But the real treat was enjoying these in the warm summer breeze with the Bow River and shimmering glacier in the distance. What kind of food do you most crave while experiencing nature?